Wednesday March 6th 1895 Will went down town. I was busy with the work and got an early dinner. It was a cold windy day. I put in the afternoon sewing. The new man come to work tonight. Thursday March 7th 1895 It was a chill windy day again. I was at home sewing all day. I fixed my every day wrapper. Will went to town on horseback in the afternoon. Friday March 8th 1895 It was a bad windy morning. Will went to town on foot. But got home by dinner time. I fixed my brown gingham dress and my black skirt. Saturday March 9th 1895 I was busy with the work all morning and after an early dinner we went to town. I did some errants and then walked over tthe river and Will came for me I did my evening work and read in the evening. Sunday March 10th 1895 It was so cold we did not go to chuirch. After an early dinner We went over home to visit. John is going to Oxford the first of the week to start a drug store. We talked with Lee about Dwight. 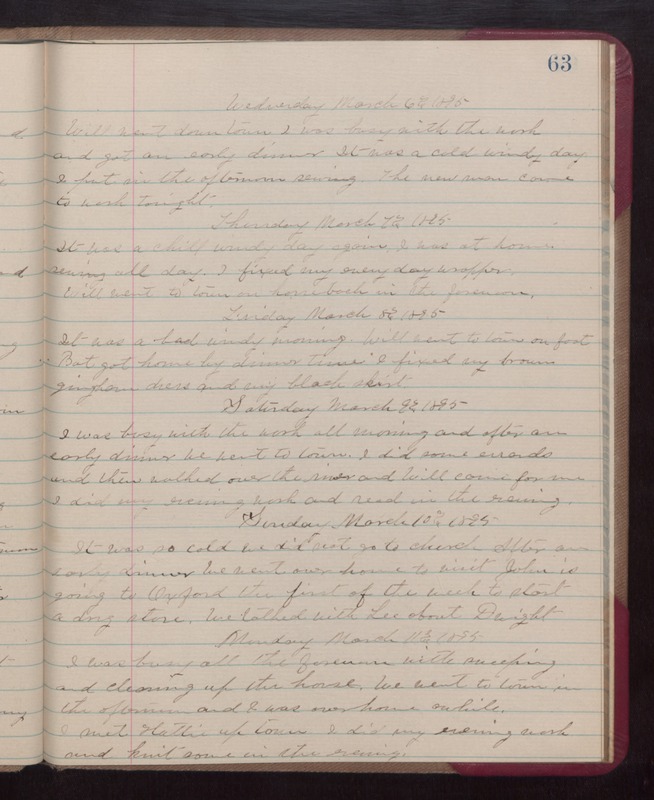 Monday March 11th 1895 I was busy all the forenoon with sweeping and cleaning up the house. We went to town in the afternoon and I was over home awhile. I met Hattie up town. I did my evening work and knit some in the evening.